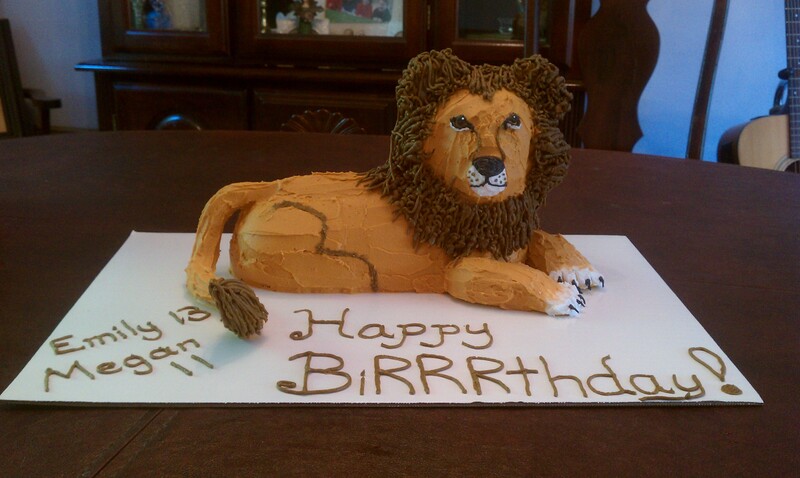 Those of you who know me or follow this blog from way back know that I make cakes, mostly for my kids’ birthdays. My cakes are pretty extravagant. One year it was an Amazon bowling cake. Another year it was a three-dimensional barn cake complete with animals. I’ve even made an anaconda cake and last year, Hogwarts! I even made a turkey cake for some friends and bassoon and snare drum cakes cakes for my sister’s wedding shower! 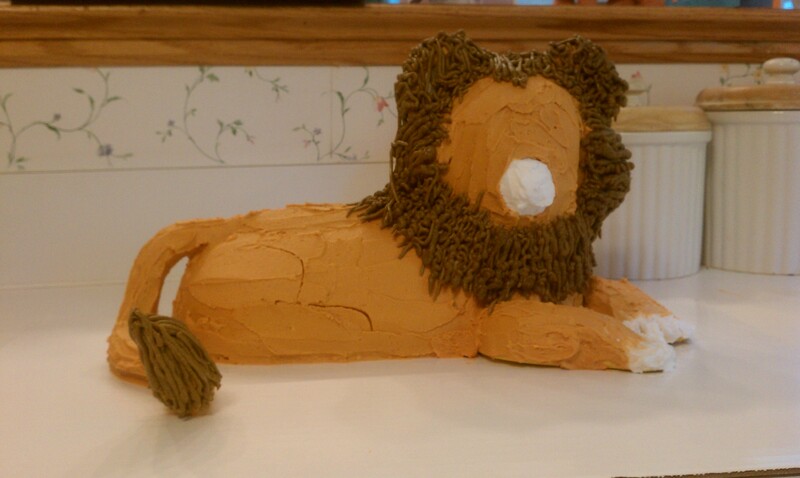 This year’s assignment was for my girls’ Narnia birthday party, so I thought a cake of Aslan would be in order. I wanted to use a pan I already had, so I turned to my lamb cake pan. 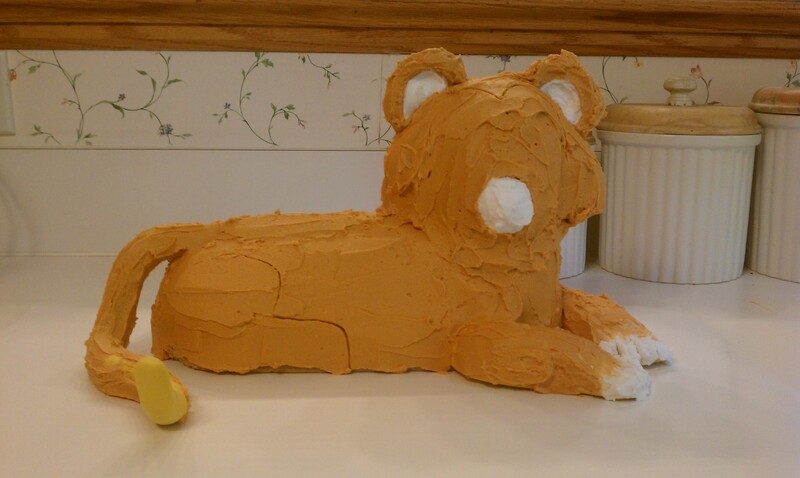 I knew I needed some additional dimensional elements to turn the lamb into a lion, and I assumed I would use fondant, as I have before. But after our trip to the Crayola factory in Easton, PA a few weeks ago, my brilliant almost-11-year-old suggested something different: Crayola’s model magic! So I created ears, a tail, and front paws from the easily available, easy to color, and very non-toxic stuff a few days before cake decorating day and set it to dry. 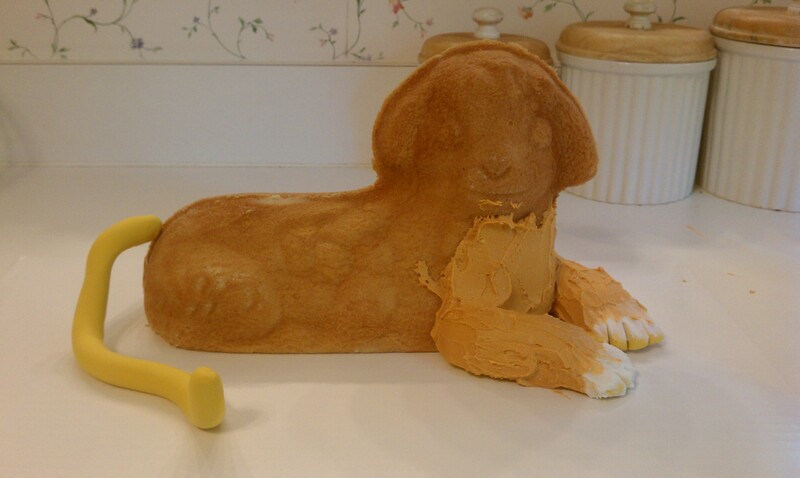 There was only one website I found that used the lamb cake pan to create a lion and though it was cute, it wasn’t the look I was hoping to create. I used two other websites for inspiration and got to work. First came the cake baking. It started like this. 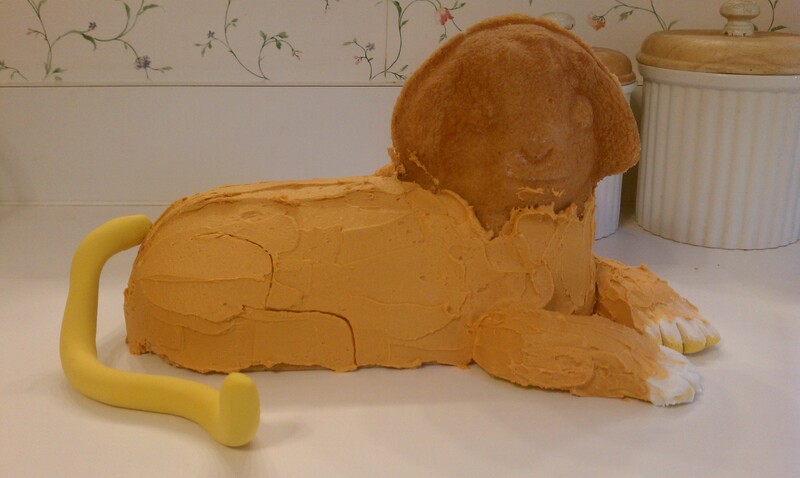 The next step was to frost the front legs. I intended to leave the model magic it’s own color, but as I worked, I realized that it made more sense to frost it to match. You can see the tail laid out as well, showing the original color of the model majic after we tinted the base yellow color with brown and orange marker. We are already looking more lion-like! Note the white on the fronts of the paws. This was one of the little details that really made a difference later on. You can still see a bit of the yellow of the model magic showing through at this point. Next I finished frosting the rest of the body. I frosted flat because I knew the texture would come mostly from the mane later on. I used a toothpick to drag an outline of the back haunches, which I will fill-in later with a contrasting frosting color. Next came the lion ears. I frosted them with white on the inside and tawny on the outside. Because the model magic is so LIGHT when it dries, I was able to “glue” the ears on with frosting – no toothpicks needed! Interestingly, the lamb ears essentially disappear when the lion ears are added. 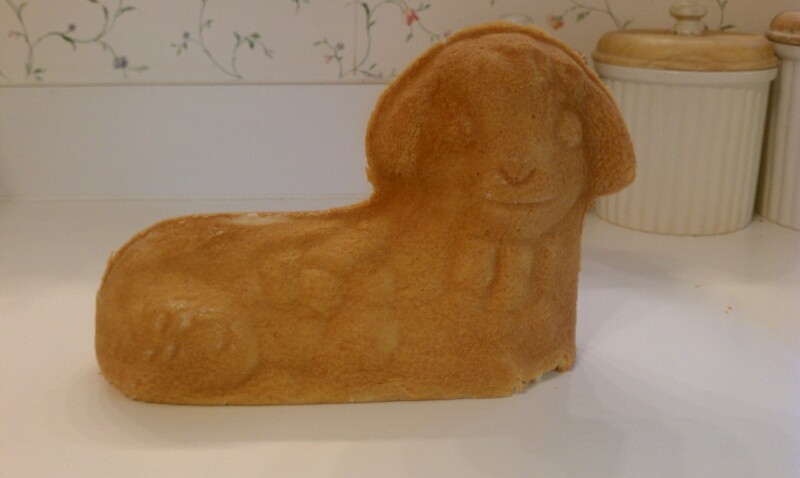 The lamb pan ears become part of the mane later on. 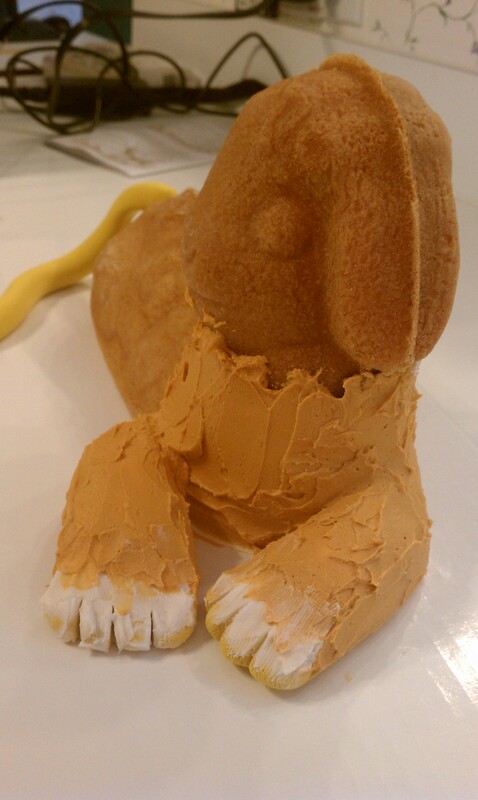 I also added frosting to the tail and some white for the muzzle on this step. At this point, I was a bit alarmed because it looked so much like a house-cat. But hey, what’s a lion but a big, wild house-cat, right? Next, it was time for the mane. I used a #2 decorating tip to pull from the face back. 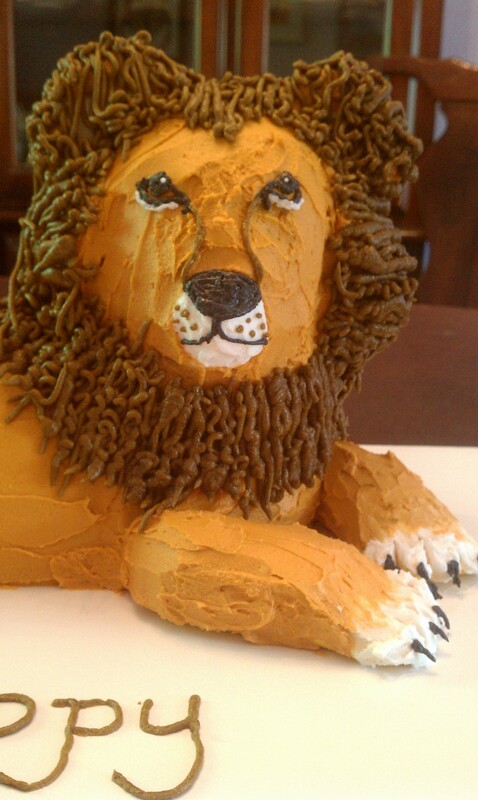 I noticed that lions’ faces are heart-shaped, so I outlines that shape with a toothpick before I started. I intended to cover the ears all along, so I dragged over them. I also didn’t worry about connecting the disparate mane pieces or how curvy they were. I just had fun with it! I did continue the mane over onto the back of the head, most of the way down. 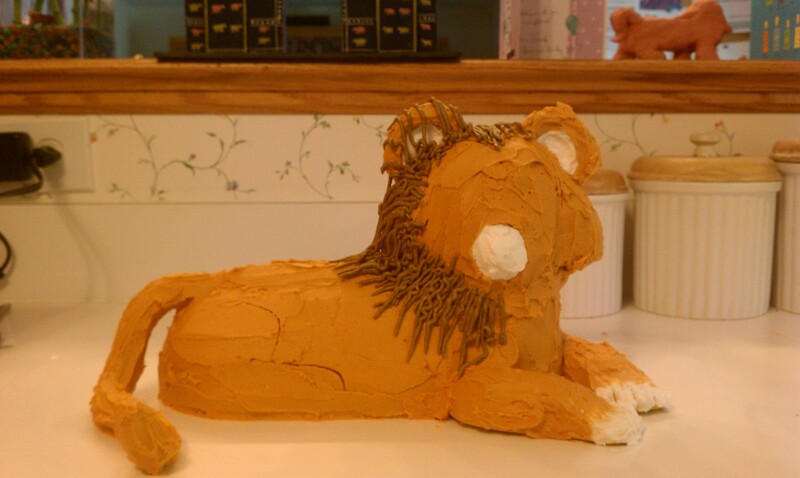 I was happy with the mane, but in retrospect, I would build out with frosting the space between the right lion ear and the lamb ear from the mold, just to avoid that weird in-cut. But one of my FAVORITE parts was using the same decorating tip to pull the tail. I had already curved the model magic upward and let it dry leaning against an upside-down glass custard cup, but when I added the tail hair, it really made the cake look great! daughter’s private art lessons! I ran back and forth between the kitchen and the dining room studying her latest painting of a cat for eye and muzzle details, and I think it paid off! I also used the same #2 tip to pull claws of black out of the white part of the paw. They curved just perfectly all on their own (thank you, gravity). Finally, I added the finishing touches of the girls’ names and ages, as well as an appropriate lion-ly happy “biRRRRthday” greeting and voila! 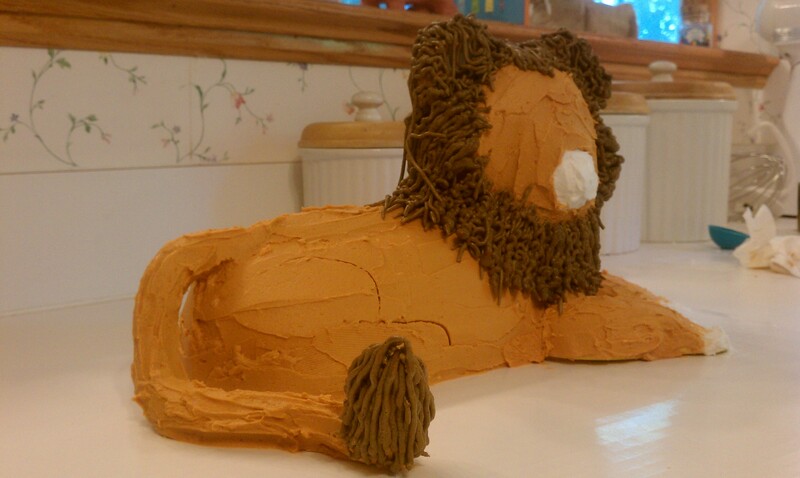 Meet Aslan, the Narnia birthday lion.